The Bullitt Center in Seattle, Washington, is one of the most self-sufficient buildings on the planet. It is net zero energy and, after the water reuse system is approved by city authorities, net zero water. Net zero means that the building uses the same amount as it creates or generates – it is self-sufficient. In a series of posts here on GBE, we will look at what makes this building tick. The Bullitt Center uses photovoltaic (PV) panels to generate electricity. Conventional wisdom would say that Seattle isn’t the sunniest of locations to set up a solar energy system, but it works. During the summer, when sunshine is abundant, the system sends its excess electricity out to the grid, helping the City keep up with increased demand. During the winter months, when it is overcast, the Center draws from the grid as needed. Over a year’s time, the amount of electricity generated by the PV system is above the amount used by the building and its occupants. The solar panels, provided by SunPower, are some of the highest efficiency panels available in the world for commercial applications. 570 panels cover the distinctive mortar board roof structure that extends out over the edge of the building. The panels collectively generate approximately 230,000 KWH per year. Tenants of the six-story, 50,000 square foot building are allotted an energy budget each month, depending on the size of the space they lease. Those tenants that stay within their budget are charged nothing for the electricity they use. This provides incentives for tenants to be energy-efficient. The building uses approximately 230,000 KWH per year, compared to a typical office building of the same size that uses 1,077,000 KWH. The building uses daylighting, geothermal heating and cooling, operable windows, and other measures to increase its energy efficiency. The design team applied for special permission from the City of Seattle to increase the height of each floor of the building to allow for improved daylighting further into the core of the structure, reducing the need for heat-generating light fixtures. Geothermal and radiant floor heating and cooling are used to efficiently moderate temperatures within. The building management system (BMS) regulates the heating and cooling systems, and even controls the window shades and operable windows to optimize efficiency. The BMS acts as the “brain” for the entire building, controlling all processes, such as composting, water treatment, and ventilation. 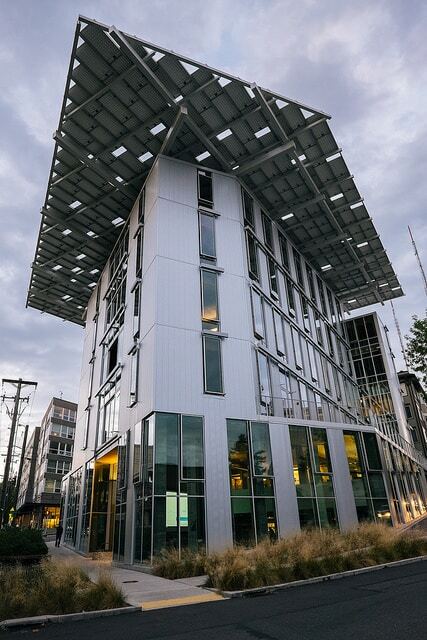 The combination of site-generated electricity and high energy efficiency means the Bullitt Center uses the same amount of energy as it produces. It has a net zero energy effect on the environment – the true definition of a sustainable building. The Center is seeking certification from the Living Building Challenge, which recognizes structures that go beyond “green” and take responsibility for their effects on the environment and take steps to reduce those effects and/or offset them. 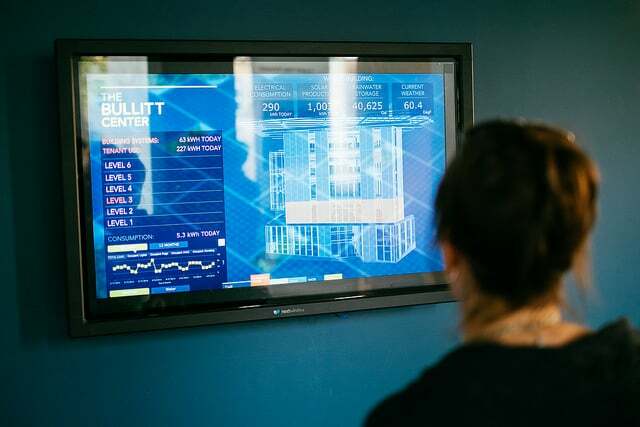 After one year of operation, the Bullitt Center used 147,000 KWH of electricity and generated 252,000 KWH. The project was 85% occupied during this time and tenants were extremely satisfied with the building and its greenness. Source | Images: Bullit Center, Taomeister via photopin cc.